MONTREAL, Canada—Fifteen minutes before the women’s all-around final, Ragan Smith, the U.S. national champion and one of the few remaining favorites left standing—after Larisa Iordache withdrew due to an Achilles tear right before preliminaries and Rebecca Andrade of Brazil went down with an ACL injury during training—was scratched from the competition. She had injured her ankle during the vault warmup. With Smith’s withdrawal, it seemed like the American streak—every world all-around champion since 2011 has been from the U.S.—was going to come to an end. 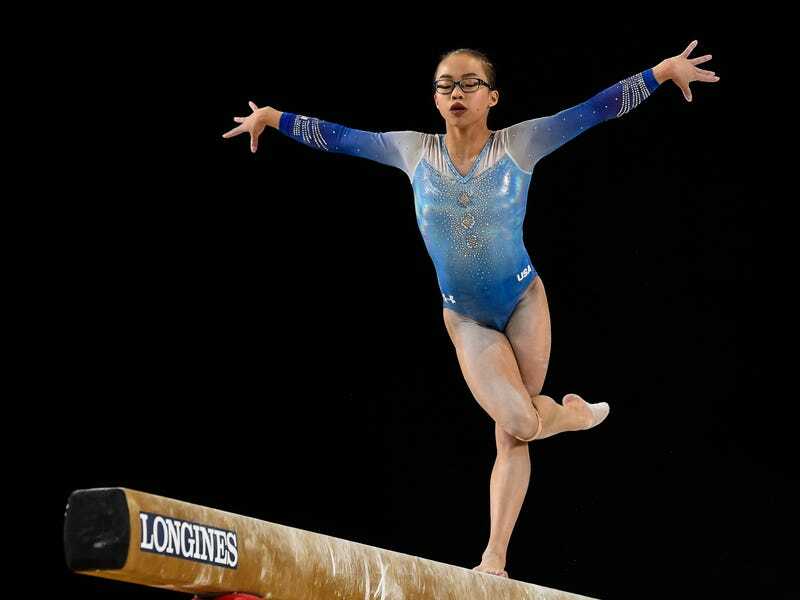 The only remaining American in the final was 16-year-old Morgan Hurd, a first-year senior from Delaware who was adopted as a toddler from China. Hurd was the sixth-place qualifier into the final. Though she was certainly capable of moving up in the rankings—she counted a fall on floor exercise during preliminaries—no one really expected her to win. The remaining favorites for the title (now sans Smith) were 21-year-old Mai Murakami of Japan, who was the top qualifier to the all-around final and 22-year-old Ellie Black of Canada, who was third behind Smith in the qualifications. Murakami was in the hunt until she fell from beam in the third rotation. Black was in it all the way the very end. She finished just a tenth of a point behind Hurd. If Black hadn’t grabbed the beam with her hands to steady herself after a skill went awry, she would’ve won the gold. And if Murakami hadn’t fallen from the beam, she would’ve won. I’m doing the would’ve/should’ve/could’ve thing to underscore just how close this competition was and how consequential those mistakes, big and small, were to the eventual outcome. This is a departure from the last few world championships I’ve attended. Those were all Simone Biles affairs. After 2013, Biles was expected to win every competition she entered, and she had so much more difficulty than the rest of the women’s field that even a fall wouldn’t take her out of first place. While her dominance was awe-inspiring, it drained competitions of any suspense. Biles’s scores would merely confirm what you already knew—that she was the winner. But tonight, the audience didn’t know how it would play out before the judges entered their marks. The scores determined the outcome; they didn’t merely confirm it. It was legitimately exciting waiting for Black’s floor score to be announced, knowing that this would determine whether or not she would be Canada’s first ever world champion in gymnastics or whether she’d simply be Canada’s first all-around medalist of any sort. For Black, it turned out to be the latter—Canada’s first all-around medal at a world championships. I rode the metro back from Olympic Stadium with two Canadian gymnastics fans who told me that though they were disappointed that Black didn’t come out on top, they were still so excited that Canadian gymnastics was enjoying this kind of success at the international level. They really couldn’t believe that one of their gymnasts had won an all-around medal at the world championships. Bronze medalist Elena Eremina, 16, didn’t win a milestone medal for Russia—they’ve got a lot of hardware in gymnastics—but she pulled off one of the cleanest competitions of the night, which is no small feat given Russia’s legendary inconsistency in competition. Hurd, like Eremina, also had a very clean competition. It wasn’t perfect. Her beam was choppy with more than a couple of wobbles. And she went out of bounds on one of her floor passes, though this was an improvement from the preliminaries where she actually under-rotated and put her knee down, which was tantamount to a fall and received the same deduction, one full point off. That said, out of bounds and all, this routine is a delight. Hurd was the first gymnast to compete on floor in the final group. She had to wait until Black competed in the second-to-last spot to know which step on the podium she’d be on—first or second. Hurd, who hadn’t even made the all-around podium at the U.S. national championships this year, is now the world all-around champion. And the American winning streak continues. Is Larisa Iordache The Last Romanian Gymnast?